Welcome to day five of the Frostblood blog tour, in particular, my Fire post! 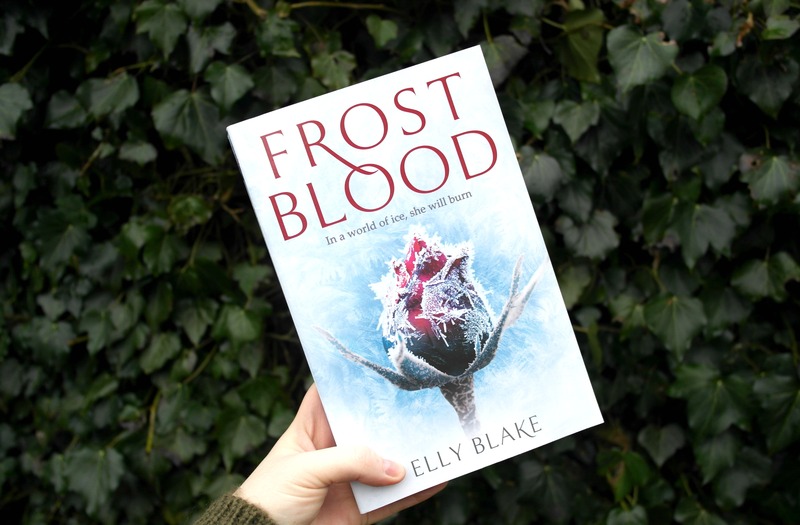 I’m so excited to have received a copy of Frostblood by Elly Blake from Chapter5 Books for this tour, and I’ve even got a little extract for you. Stick around to read my thoughts and for a sneak peek of Frostblood! First of all, let me just start with, how freakin’ beautiful is this cover? With receiving this just a little earlier than the publication date, I can’t say for sure that this is the final cover by oh boy it should be, just look at that sparkle! I love Blake’s writing style. She has an epic way of world building where I could picture literally every scene and character, to the point where looking back I feel as though I watched a film! While Frostblood wasn’t necessarily fast paced and packed with action from start to finish, I really enjoyed the way that the plot developed; I was gripped from page one and didn’t want the story to end. I found myself really invested in the characters, especially Arcus and the monks! I loved that Ruby was strong willed, opinionated and sassy. She questioned everything and didn’t take no for an answer. One of my favourite things about the book: the romance, It is totally deserving of the phrase ‘swoon worthy’. It was slow building, no insta love here thank you very much, therefore totally believable and aided the plot rather than just being added in for the sake of it. There were some obvious YA tropes in this book, like the brooding male love interest and the student who is slow and reluctant to learn but eventually becomes super powerful, but you know what? I don’t care, I loved all of it, especially seeing Ruby grow into her power. Plus, Arcus’ moods were totally justified and I really felt for him throughout this book. I genuinely cannot believe that this is Blake’s debut novel. She has such a fantastic way of writing that had me hooked from beginning to end, I felt like I was along for the ride on every single page. I don’t know how I’m going to be able to wait for the next instalment! I gave Frostblood a very well deserved 4.5/5 stars. But the Frostblood warrior made no move, perhaps assessing, waiting for some indication of my strength. I wasn’t so patient. I sent a sizzling jolt of flame at his feet. He jumped nimbly out of the way and countered with a blast of frost that hit the ground in front of me, sending up a cloud of dust. I spun a tornado of hot air at him. He put out his hands and the air dispersed in a hiss. Pinwheels of fire roared from my hands. He slammed each one down with his steel wrist guards and blasted cold air back at me. “You think this is a nice game, don’t you?” I called, twisting my hands to send twin vortices of air so hot that the water in the air turned to vapor. He let it pass over him without a flicker of reaction, as if it were a spring breeze. Annoyance tightened my shoulders. His frost was even stronger than Gravnach’s. I threw a bolt of fire at his helm. That got to him. He stumbled back before sending a gust of frigid air that made my legs shake with the effort of holding my ground. Our attacks grew more rapid. I kicked up a sheet of flame. He coated himself with protective ice. I melted the ice with heated air, then sent another tail of the dragon. He frosted the ground under my feet, catching me in the middle of a movement. My foot twisted as I slipped and fell. I tried to push myself up but fell back to the ground. Kane stalked over to me, his silhouette blotting out the sun. I turned my head to see the king leaning forward in his balcony, Marella rigid beside him. And between them, a dark shape hovering, its pointed head and shoulders growing and sharpening. There was no indication that anyone else could see it, but I could feel its presence, even with my eyes closed. As I felt the darkness rise, I sent another stream of fire at Kane. Whether it was because of the solstice, or the darkness filling me, or just the fact that my hatred had finally freed me of all restraint, my fire seemed to burn hotter than it ever had. His tunic caught and he threw out frost to quench it. He struck at me with frost that hissed into harmless steam, then sent icicles screaming toward me. They melted in the cloud of heated air that surrounded me like a shield. I was too powerful already, bright as a piece of the sun. I was sure I could kill him with my fire alone. But I wanted the oblivion only the Minax could give me. The Frostblood warrior halted a few feet away and spoke. Minax afterward didn’t matter. All that mattered was losing myself in vengeance.